Arashiyama is a district in Kyoto frequented by tourists and natives alike for its bamboo grove, scenic mountains, monkey park, and more. How might I use play and discovery to bring a strong sense of place to Arashiyama? 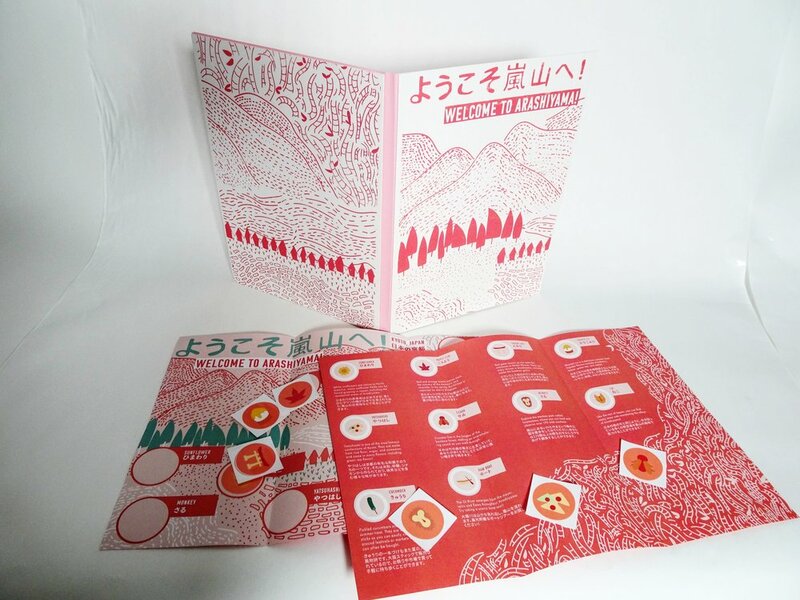 This branded kit prompts users to explore 10 different aspects of Arashiyama with an interactive map, stickers, information sheet, and hardcover booklet. As visitors explore the town, they place stickers on the map for the things they discover and experience. The corresponding information sheet allows them to learn about everything as they go. To create the stickers, I uploaded sketches using the Adobe Capture app, then traced and tweaked them in Illustrator. After deciding on a color palette, I sent the stickers off for print. The illustration was achieved in Illustrator using a Wacom tablet. It depicts Arashiyama’s bamboo grove, mountains, river, forests, fields, monkey beach, residential area, and marketplace. This design was used for the full-color map as well as the covers. To screen print the covers, I made transparencies of my design (DIY-ed using printer paper and vegetable oil), exposed the design on the screen, mixed paint, and then produced my final design on mounting board. 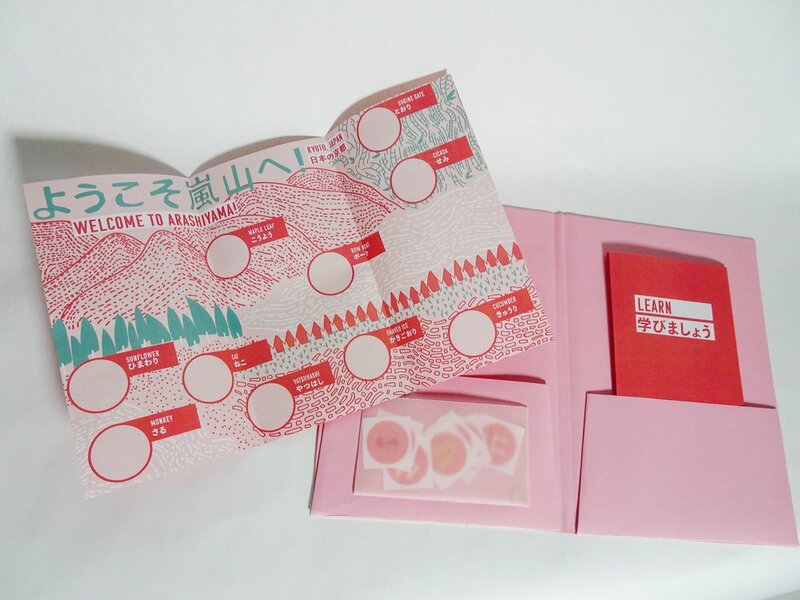 The hardcover folder was hand-constructed with a vellum pocket for the stickers. 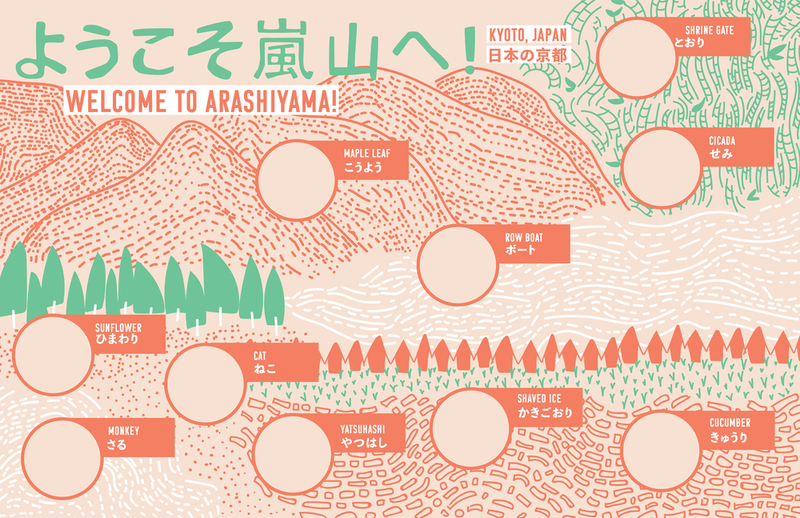 The entire kit is completely bilingual - in English and Japanese - because Arashiyama’s attractions draw in natives and tourists alike. English was chosen in addition to Japanese because 1.5 billion people speak English, and it’s the formal language in 70 countries. Arashiyama’s hospitality industry includes many ryokan (traditional Japanese inns), so many visitors may stay here for a week or more. My kit would be an exploratory learning device while visitors experience what the city has to offer, from eating kakigori from a street stand to feeding monkeys in the mountains. No matter if you are a native Japanese- or English- speaker, or learning one of those two languages, you can learn and play with my kit. In the age of going green, paper goods seem to be on the out, right? Ask Japan’s $11 billion stationery industry. Japan’s superior stationery has taken the world by storm, and a kit like this would not be out of place. I imagine my product being sold in one of the many small shops in the marketplace as a tool for learning during visitors’ stays, and keepsake after they’ve left.